Nevada’s wide range of available activities and unique outdoor terrain allow for a thrilling winter. The state has everything from amazing scenic spots to exhibits that push what you think of when you picture the high desert of Nevada. Not only is Nevada home to a great deal of wide-open desert, but it’s also home to a stark contrast of snowy mountains and winter sports. 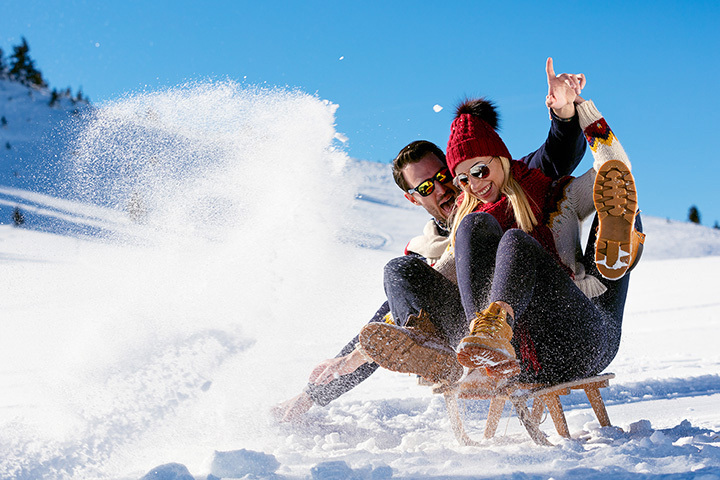 Yes, it’s possible to find snow and winter activities in Nevada! Here are our 15 favorites. A short drive from Reno, this park is great for both hiking and snow play in the winter. Unlike parks in California, this park does not have a requirement for a snow pass. There is a wide range of activities available including sledding, an area for snow snowmobiling, snowshoeing, cross country skiing and tubing. While the tours at the Ethel M. Chocolate factory are offered year round, the winter is a magical time for the factory as the the Cactus Garden next door is turned into a winter lights display. You may have not even thought about turning a cactus into a Christmas tree but this works as you tour the outdoor desert landscape. It sure doesn't hurt to be able to not only watch how they make the candies but even schedule a class on tastings with samples of course! What do you do with a huge hotel pool in the winter? You turn it into an outdoor ice skating rink of course! The pool at the Cosmopolitan transforms into the perfect spot to enjoy ice skating outdoors in Las Vegas. The roof top view of the city is an added bonus for skaters who also enjoy s'mores and other holidays treats. Ash Meadows Wildlife Refuge offers some of the best winter bird watching in the country. The species of birds is unique to the area due to its often mild winter weather but also cool weather for the season visitors. Each December the Refuge welcomes visitors for its yearly count to collect data on the range of birds visiting this winter haven. The botanical garden at the Bellagio is pretty spectacular year-round, but during the winter it becomes magical with millions of lights and festive displays as well as hosting the largest Christmas tree on the Las Vegas strip. This free attraction is fun for all ages and the world famous fountains outside of the property are synced with familiar holiday music also. The Magical Forest is open from November to late January each year for the last 25 years and has become one of the most loved and longest running holiday traditions in Southern Nevada. The outdoor display of hundreds of decorated trees is a family favorite and sure to bring the holiday spirit into even the heart of the Grinch. Families can also enjoy holiday activities, games, events and special treats as well. A short shuttle from Reno takes everyone from beginners to the more advanced skiers to this well loved ski area. With three lifts and a beginner's conveyor belt there is something for everyone. Families especially enjoy the beginner terrain which includes the Enchanted Forest Zone for the smallest newbies. Whether you enjoy a day on the slopes or attending a fun event like their yearly “Santa Crawl” Mount Rose is well worth checking out. While a ride on this historic rail system is worth taking year-round, the trip becomes even more magical in the winter. They offer a very traditional holiday favorite the “Polar Express” for children of all ages. This magical ride often includes a snow packed journey complete with cookies, hot cocoa and an appearance by the jolly man himself. For adults there are rides during the month of February to capture all that is the scenic beauty of the snow covered Nevada landscape. With a population of only about 400 full-time residents, Mount Charleston is a hiker's oasis in Clark County, Nevada. This outdoor wonder offers a very different experience than most people expect in this part of Nevada as there is a great deal of desert landscape. The rolling hills and greenery is a nice break from the desert and the natural sites for hiking as often accessible well into the winter months. The Reno Aces host this yearly tradition and it includes many must-see events for the whole family. The stadium itself is transformed into magical winter wonderland with months of “Ice Skating on the River,” as well as special weekend events that include holiday train rides, performances by local groups, more Christmas trees than you will find any other place in Reno and even a chance to catch an appearance by Santa himself. Incline Village is known for it's stunning mountain side lodging, and this is the go to spot to visit for a weekend getaway from the city. Whether you want a quiet private chalet rental that will feel like it is a world away or perhaps a small town resort, the surroundings give you the best of the winter in the mountains of Nevada. The peaceful wilderness and the crisp mountain air is the break many are seeking during the winter months. Valley of Fire State Park is the largest of it's kind in Nevada and is dedicated to the stunning rock formations of the desert landscape. Because the desert during the summer months can reach 120 degrees, the cooler winter months are a great time to explore the natural rock formations. The mild but not really cold temperatures make the time outdoors much more pleasant and the photo opportunities are amazing. While this hike may prove to be too strenuous for many during the hot summer months, it is an enjoyable trek during the cooler winter months with the big pay off being the natural hot springs in Gold Strike. The trail head is often closed during the summer months because of the high extreme temperatures of the desert but re-open for winter hikers. The loop is roughly 6 miles and without the summer heat is mid-range as far as difficulty. Ever wonder if Santa ever needs a getaway before the big day? We have found where he goes for a bit of fun at the “Shark Reef” at Mandalay Bay. Visiting the reef in the winter lets families find Santa as you have never seen him before, swimming with the sharks in the magical underwater world at this custom designed reef. This is a Santa adventure and photo opportunity you will only find in Vegas as you explore Santa's fine diving skills. There are only two times during the entire year that Las Vegas Boulevard is closed, and New Year’s Eve is the big one. Seven of the biggest hotels on the strip light off fireworks as the countdown continues and this is one amazing display. The celebration on the strip spills on to the closed streets as a crowd that rivals Time Square welcomes the new year the only way Vegas does things, BIG! With all the fireworks there isn't a bad seat anywhere on the Strip.